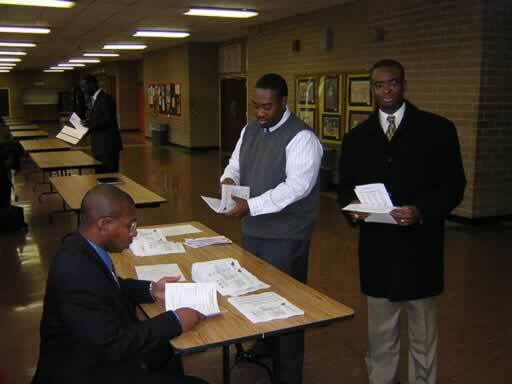 Greenville, SC: Gamma Gamma Lambda Chapter of Alpha Phi Alpha Fraternity, Inc will conduct its 26th annual Youth Program and College Fair at Southside High School on January 15, 2005 at 10 AM. Students receiving awards should be ready to assemble at 9:20 AM. The Youth program, along with the annual MLK Gala held on January 17, is an annual part of the chapter's Martin Luther King celebration. Tickets for Gala may be purchased on-line on www.gglapa.org or from any brother at the event. The MLK Youth program seeks to honor deserving high school students who have excelled in five areas: Academics, Art, Athletics, Music, and Leadership. School's administrators and teachers nominated students from their local school. Last year, over 255 awards winners were recognized, and the college fair brought nine representatives from local colleges and universities. This year event will have two sessions for parents and students about college expectations and financial aid options. This is part of a national effort by Alpha Phi Alpha called “Go-to-High-School, Go to College” which was established in 1919. Alpha Phi Alpha Fraternity, Inc., is the nation's first Greek-letter fraternity established by African-American college students. Established on December 4, 1906 on the campus of Cornell University, Alpha Phi Alpha are more than 750 chapters worldwide with over 100,000 members. Gamma Gamma Lambda Chapter is the local chapter of Alpha Phi Alpha in Greenville established in 1941. For more information about the MLK Youth Program or Upstate College Fair, please contact Will Gregg, MLK 2004 Youth Program Chairman at mlkfair@gglapa.org. Directions and Event information for 2006 Youth Program and College Fair.